There has not yet been a CD compilation released with the best Dutch rockabilly music made in the eighties. The whole rockabilly and psychobilly music has never been more than a footnote to the Dutch music history for the people who write this history. But as a fan of this kind of music, I think that this music deserves more credits than it has gotten so far. 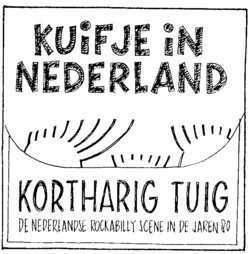 Most other underground scenes, like punk and heavy metal for example, have been documented in books and CD’s, but as far as I know nobody has done such thing for the Dutch rockabilly and psychobilly scene. A few weeks ago I was with Aris and Nathalie. Aris was in the rockabilly band Crackle Rattle Bash and is still in contact with many people from the rockabilly scene. “Why don’t we make that book & CD?” he asked with his mouth full of apple crumble cake between two other of his brilliant ideas. I didn’t react, but I heard him, and I remembered it too the next day. Why not? I would love to have a CD with all the recordings that I know to exist, and I am even more interested in all the recordings that I do not know to exist. Since most of the bands never got further that a demo tape or a 45 on a private label, there must be enough for at least one CD. When I proposed to Nathalie and Aris to serious take up this project they immediately offered to participate and to finance the project. Nathalie came up with a name for the project that makes success guaranteed: Kuifje in Nederland . (“Kuifje” is the Dutch name for Tintin, but it also means the kind of hairdo that is typical for rockabilly.) The idea is to start a website, where we invite everybody to send in information about bands, persons, locations and records that should be mentioned in the book. If there is enough interest, the book and the CD will grow naturally. If not, and the site ends up as a dead end road, the project is cancelled. But I think that there is mpore than a fair chance that within a year or so there will be a CD and a book out. There is video on YouTube where you can see and hear The Tranquilizzers play all the four songs of that EP.